Fall/Winter. Snowball of financial crisis. «Floating» ruble. Considering complicated situation on political stage and sharp fall in ruble, «Antonio Merloni» Company announces 10% anti-recessionary discounts in January, 2015 for the equipment for independent gasification. Discounts are activated only in case of 100% prepayment for complete order including mounting. This step is forwards those who have started or are just planning construction, for those who wanted to buy equipment from «Antonio Merloni» during the year but were financially embarrassed. January is ideal month to solve the questions of independent gasification for a private house. Italians respect created situation. They don’t support inadequate sanctions of European Union (though Venice declared its desire to withdraw from EU, eloquently expressing an outrage against anti-Russian sanctions), which is not able to take its own position. «Antonio Merloni» Company knows that Russian clients have a rough time; that is why it embarks on particular actions – January discounts. 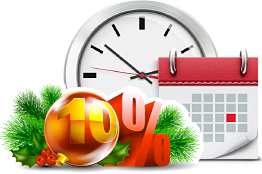 «10%» anti-recessionary discount for gas tanks from «Antonio Merloni Cylinders Ghergo Group S.p.A.» Corporate Group is valid till 31 of January, 2015. All who paid their orders by the end of the first month of new year will get anti-recessionary discount for reliable and high quality Italian equipment for independent gas supply systems. Address the managers and sales agents from GC «Terrikom» which is official representative of Italian Company «Antonio Merloni» in Russia. Make your plans real.